Hooked to Chinese? 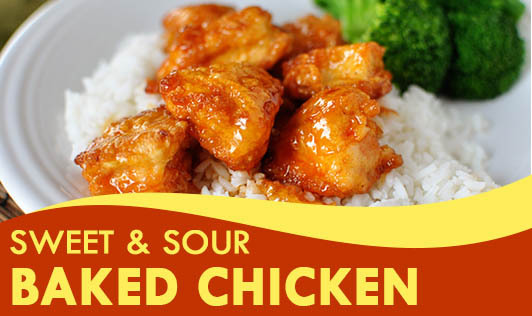 Try out this Sweet & Sour Baked chicken. This is baked and not fried chicken recipe, tossed in a sweet, savory sauce that's also low in sugar content. • Preheat the oven at 380°F. • Grease the baking sheet with a little oil. • Take ¼ cup of wheat flour in a bowl. • Add the chicken pieces to the beaten egg. • Take a chicken piece and shake it to remove excess egg and coat it with flour. • Repeat the process for all the chicken pieces. • Now place the chicken pieces evenly on the baking tray and bake the chicken for about 10 minutes until it is thoroughly cooked through. • In a bowl mix, the chicken broth, cornstarch, sugar, vinegar, and soya sauce, and whisk it thoroughly. • Heat 2 tsp of oil in a non-stick pan. • Add the chopped garlic and ginger until slightly soft and fragrant. • Now add the broth mixture and red chili flakes, and cook until it is slightly thickened. • Finally add the chicken and toss to coat the pieces. • Garnish with spring onions. Note: Vegetarians can use paneer instead of chicken.